What does next generation learning look like in practice? 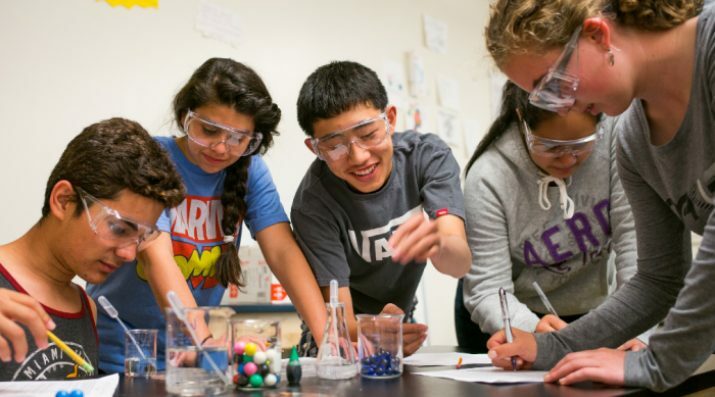 NGLC has provided grant funding to seed New Designs for School that lead to better learning outcomes and have the potential to scale, with the ultimate goal of reversing stagnant academic progress and an unacceptable achievement gap among K-12 students. Solving this challenge requires taking the best of what we know about learning, student support, equity and cultural relevance, and effective pedagogy to fundamentally, not incrementally, change the learning experience in schools. When educators emphasize a broader, deeper, more integrated definition of student success in their redesign, the schools they create are game-changers. These models can break the inertia that has prevented educational reform from making the dramatic improvements needed for the nation’s youth. Solving this challenge would lead to breakthroughs in student learning, high school graduation, and college completion—particularly for low-income students and students of color. NGLC has engaged educators in developing solutions to this challenge through grant investments and a robust content strategy. The first grant opportunity launched in October 2011. NGLC then spurred innovation in school design through the Regional Funds for Breakthrough Schools, with seven sites around the nation and 88 schools in the midst of designing and launching next gen learning. As a learning community open to all educators, the NGLC community has made a concerted effort to broadly share successes, lessons learned, and advice to support the growth of better school designs across the nation. We are motivated by the urgent need to provide more of today’s youth with a K-12 education that empowers them to lead a successful life. And now, schools, districts, and passionate community members who are interested in New Designs for School now can tap into the expertise of NGLC directly. Learn more about NGLC Services.